For other uses, see Firefighter (disambiguation). "Fireman" and "Firewoman" redirect here. For other uses, see Fireman (disambiguation) and Firewoman (disambiguation). A firefighter is a rescuer extensively trained in firefighting, primarily to extinguish hazardous fires that threaten life, property and the environment as well as to rescue people and animals from dangerous situations. 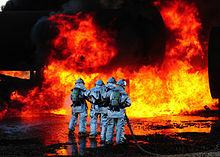 A Naval Forces Japan firefighter douses a fire during a training drill in July 2008. He is equipped with a fire hose with combination nozzle, breathing apparatus, helmet and full structural firefighting kit. The complexity of modern, industrialized life has created an increase in the skills needed in firefighting technology. The fire service, also known in some countries as the fire brigade or fire department, is one of the three main emergency services. From urban areas to aboard ships, firefighters have become ubiquitous around the world. Firefighters and fire apparatus at the scene of a factory fire in Grand Rapids, Michigan. The skills required for safe operations are regularly practiced during training evaluations throughout a firefighter's career. Initial firefighting skills are normally taught through local, regional or state-approved fire academies or training courses. Depending on the requirements of a department, additional skills and certifications such as technical rescue and pre-hospital medicine may also be acquired at this time. Firefighters work closely with other emergency response agencies such as the police and emergency medical service. A firefighter's role may overlap with both. Fire investigators or fire marshals investigate the cause of a fire. If the fire was caused by arson or negligence, their work will overlap with law enforcement. Firefighters also frequently provide some degree of emergency medical service, in addition to working with full-time paramedics. The basic tasks of firefighters include: fire suppression, rescue, fire prevention, basic first aid, and investigations. Firefighting is further broken down into skills which include: size-up, extinguishing, ventilation, search and rescue, salvage, containment, mop up and overhaul. A fire burns due to the presence of three elements: fuel, oxygen and heat — often referred to as the fire triangle. Sometimes it is known as the fire tetrahedron if a fourth element is added: a chemical chain reaction which can help sustain certain types of fire. The aim of firefighting is to deprive the fire of at least one of those elements. Most commonly this is done by dousing the fire with water, though some fires require other methods such as foam. Firefighters are equipped with a wide variety of equipment for this purpose that include: ladder trucks, pumper trucks, tanker trucks, fire hose, and fire extinguishers. While sometimes fires can be limited to small areas of a structure, wider collateral damage due to smoke, water and burning embers is common. Utility shutoff (such as gas and electricity) is typically an early priority for arriving fire crews. Specific procedures and equipment are needed at a property where hazardous materials are being used or stored. Structure fires may be attacked with either "interior" or "exterior" resources, or both. Interior crews, using the "two in, two out" rule, may extend fire hose lines inside the building, find the fire and cool it with water. Exterior crews may direct water into windows and other openings, or against any nearby fuels exposed to the initial fire. Hose streams directed into the interior through exterior wall apertures may conflict and jeopardize interior fire attack crews. See also Fire suppression for other techniques. Buildings that are made of flammable materials such as wood are different from fire-resistant building materials such as concrete. Generally, a "fire-resistant" building is designed to limit fire to a small area or floor. Other floors can be safe by preventing smoke inhalation and damage. All buildings suspected or on fire must be evacuated, regardless of fire rating. Some fire fighting tactics may appear to be destructive, but often serve specific needs. For example, during ventilation firefighters are forced to either open holes in the roof or floors of a structure (called vertical ventilation), or open windows and walls (called horizontal ventilation) to remove smoke and heated gases from the interior of the structure. Such ventilation methods are also used to improve interior visibility to locate victims more quickly. Ventilation helps to preserve the life of trapped or unconscious individuals as it releases the poisonous gases from inside the structure. Vertical ventilation is vital to firefighter safety in the event of a flashover or backdraft scenario. Releasing the flammable gases through the roof eliminates the possibility of a backdraft, and the removal of heat can reduce the possibility of a flashover. Flashovers, due to their intense heat (900–1200° Fahrenheit) and explosive temperaments, are commonly fatal to firefighter personnel. Precautionary methods, such as smashing a window, reveal backdraft situations before the firefighter enters the structure and is met with the circumstance head-on. Firefighter safety is the number one priority. Whenever possible, property is moved into the middle of a room and covered with a salvage cover, a heavy cloth-like tarp. Various steps such as retrieving and protecting valuables found during suppression or overhaul and boarding windows and roofs can divert or prevent post-fire runoff. Wildfires (known in Australia as bushfires) require a unique set of strategies and tactics. 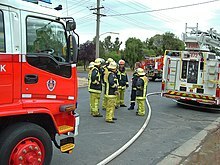 In many countries such as Australia and the United States, these duties are mostly carried out by local volunteer firefighters. Wildfires have some ecological role in allowing new plants to grow, therefore in some cases they will be left to burn. Priorities in fighting wildfires include preventing the loss of life and property. A demonstration of a vehicle extrication. Firefighters rescue people (and animals) from dangerous situations such as crashed vehicles, structural collapses, trench collapses, cave and tunnel emergencies, water and ice emergencies, elevator emergencies, energized electrical line emergencies, and industrial accidents. In less common circumstances, Firefighters rescue victims from hazardous materials emergencies as well as steep cliffs, embankment and high rises - The latter is referred to as High Angle Rescue, or Rope Rescue. Many fire departments, including most in the United Kingdom, refer to themselves as a fire and rescue service for this reason. Large fire departments, such as the New York City Fire Department and London Fire Brigade, have specialist teams for advanced technical rescue. As building fires have been in decline for many years in developed countries such as the United States, rescues other than fires make up an increasing proportion of their firefighters' work. Firefighters frequently provide some degree of emergency medical care. In some jurisdictions first aid is the only medical training that firefighters have, and medical-only calls are the sole responsibility of a separate emergency medical services (EMS) agency. Elsewhere, it is common for firefighters to respond to medical-only calls. The impetus for this is the growing demand for emergency medicine and the decline of fires and traditional firefighting call-outs—though fire departments still have to be able to respond to them—and their existing ability to respond rapidly to emergencies. A rapid response is particularly necessary for cardiac arrests, as these will lead to death if not treated within minutes. The dispatch of firefighters to medical emergencies is particularly common in fire departments that run the EMS, including most large cities of the United States. In those departments, firefighters are often jointly trained as emergency medical technicians in order to deliver basic life support, and more rarely as paramedics to deliver advanced life support. In the United Kingdom, where fire services and EMS are run separately, fire service co-responding has been introduced more recently. Another point of variation is whether the firefighters respond in a fire engine or a response car. Either way, separate employees to crew ambulances are still needed, unless the firefighters can work shifts on the ambulances. Airports employ specialist firefighters to deal with potential ground emergencies. Due to the mass casualty potential of an aviation emergency, the speed with which emergency response equipment and personnel arrive at the scene of the emergency is of paramount importance. When dealing with an emergency, the airport firefighters are tasked with rapidly securing the aircraft, its crew and its passengers from all hazards, particularly fire. Airport firefighters have advanced training in the application of firefighting foams, dry chemical and clean agents used to extinguish burning aviation fuel. Fire departments are usually the primary agency that responds to an emergency involving hazardous materials. Specialized firefighters, known as hazardous materials technicians, have training and certification in chemical identification, leak control, decontamination, and clean-up procedures. Fire departments frequently provide advice to the public on how to prevent fires in the home and work-place environments. 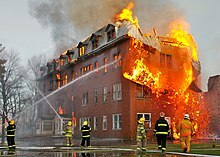 Fire inspectors or fire marshals will directly inspect businesses to ensure they are up to the current building fire codes, which are enforced so that a building can sufficiently resist fire spread, potential hazards are located, and to ensure that occupants can be safely evacuated, commensurate with the risks involved. Fire suppression systems have a proven record for controlling and extinguishing unwanted fires. Many fire officials recommend that every building, including residences, have fire sprinkler systems. Correctly working sprinklers in a residence greatly reduce the risk of death from a fire. With the small rooms typical of a residence, one or two sprinklers can cover most rooms. In the United States, the housing industry trade groups have lobbied at the State level to prevent the requirement for Fire Sprinklers in 1 and 2 bedroom homes. Other methods of fire prevention are by directing efforts to reduce known hazardous conditions or by preventing dangerous acts before tragedy strikes. This is normally accomplished in many innovative ways such as conducting presentations, distributing safety brochures, providing news articles, writing public safety announcements (PSA) or establishing meaningful displays in well-visited areas. Ensuring that each household has working smoke alarms, is educated in the proper techniques of fire safety, has an evacuation route and rendezvous point is of top priority in public education for most fire prevention teams in almost all fire department localities. Fire investigators, who are experienced firefighters trained in fire cause determinism, are dispatched to fire scenes, in order to investigate and determine whether the fire was a result of an accident or intentional. Some fire investigators have full law enforcement powers to investigate and arrest suspected arsonists. To allow protection from the inherent risks of fighting fires, firefighters wear and carry protective and self-rescue equipment at all times. A self-contained breathing apparatus (SCBA) delivers air to the firefighter through a full face mask and is worn to protect against smoke inhalation, toxic fumes, and super heated gases. A special device called a Personal Alert Safety System (PASS) is commonly worn independently or as a part of the SCBA to alert others when a firefighter stops moving for a specified period of time or manually operates the device. The PASS device sounds an alarm that can assist another firefighter (firefighter assist and search team (FAST), or rapid intervention team (RIT), in locating the firefighter in distress. Firefighters often carry personal self-rescue ropes. The ropes are generally 30 feet long and can provide a firefighter (that has enough time to deploy the rope) a partially controlled exit out of an elevated window. Lack of a personal rescue rope is cited in the deaths of two New York City Firefighters, Lt. John Bellew and Lt. Curtis Meyran, who died after they jumped from the fourth floor of a burning apartment building in the Bronx. Of the four firefighters who jumped and survived, only one of them had a self-rescue rope. Since the incident, the Fire Department of New York City has issued self-rescue ropes to their firefighters. Heat injury is a major issue for firefighters as they wear insulated clothing and cannot shed the heat generated from physical exertion. Early detection of heat issues is critical to stop dehydration and heat stress becoming fatal. Early onset of heat stress affects cognitive function which combined with operating in dangerous environment makes heat stress and dehydration a critical issue to monitor. Firefighter physiological status monitoring is showing promise in alerting EMS and commanders to the status of their people on the fire ground. Devices such as PASS device alert 10–20 seconds after a firefighter has stopped moving in a structure. Physiological status monitors measure a firefighter's vital sign status, fatigue and exertion levels and transmit this information over their voice radio. This technology allows a degree of early warning to physiological stress. These devices are similar to technology developed for Future Force Warrior and give a measure of exertion and fatigue. They also tell the people outside a building when they have stopped moving or fallen. This allows a supervisor to call in additional engines before the crew get exhausted and also gives an early warning to firefighters before they run out of air, as they may not be able to make voice calls over their radio. Current OSHA tables exist for heat injury and the allowable amount of work in a given environment based on temperature, humidity and solar loading. Another leading cause of death during firefighting is structural collapse of a burning building (e.g. a wall, floor, ceiling, roof, or truss system). Structural collapse, which often occurs without warning, may crush or trap firefighters inside the structure. To avoid loss of life, all on-duty firefighters should maintain two-way communication with the incident commander and be equipped with a personal alert safety system device on all fire scenes and maintain radio communication on all incidents(PASS). Francis Brannigan was the founder and greatest contributor to this element of firefighter safety. In the United States, 25% of fatalities of firefighters are caused by traffic collisions while responding to or returning from an incident. Other firefighters have been injured or killed by vehicles at the scene of a fire or emergency (Paulison 2005). A common measure fire departments have taken to prevent this is to require firefighters to wear a bright yellow reflective vest over their turnout coats if they have to work on a public road, to make them more visible to passing drivers. In addition to the direct dangers of firefighting, cardiovascular diseases account for approximately 45% of on duty firefighter deaths. Firefighters have sometimes been assaulted by members of the public while responding to calls. These kinds of attacks can cause firefighters to fear for their safety and may cause them to not have full focus on the situation which could result in injury to their selves or the patient. Firefighting has long been associated with poor cardiovascular outcomes. In the United States, the most common cause of on-duty fatalities for firefighters is sudden cardiac death. In addition to personal factors that may predispose an individual to coronary artery disease or other cardiovascular diseases, occupational exposures can significantly increase a firefighter's risk. Historically, the fire service blamed poor firefighter physical condition for being the primary cause of cardiovascular related deaths. However, over the last 20 years, studies and research has indicated the toxic gasses put fire service personnel at significantly higher risk for cardiovascular related conditions and death. For instance, carbon monoxide, present in nearly all fire environments, and hydrogen cyanide, formed during the combustion of paper, cotton, plastics, and other substances containing carbon and nitrogen. The substances inside of materials change during combustion their bi-products interfere with the transport of oxygen in the body. Hypoxia can then lead to heart injury. In addition, chronic exposure to particulate matter in smoke is associated with atherosclerosis. Noise exposures may contribute to hypertension and possibly ischemic heart disease. Other factors associated with firefighting, such as stress, heat stress, and heavy physical exertion, also increase the risk of cardiovascular events. During fire suppression actives a firefighter can reach peak or near peak heart rates which can act as a trigger for a cardiac event. For example, tachycardia can cause a plaque build up to break loose and lodge itself is a small part of the heart causing myocardial infarction, also known as a heart attack. This along with unhealthy habits and lack of exercise can be very hazardous to firefighter health. A 2014 retrospective longitudinal study showed that firefighters are at higher risk for certain types of cancer. Firefighters had mesothelioma, which is caused by asbestos exposure, at twice the rate of the non-firefighting working population. Younger firefighters (under age 65) also developed bladder cancer and prostate cancer at higher rates than the general population. The risk of bladder cancer may be present in female firefighters, but research is inconclusive as of 2014. Preliminary research from 2015 on a large cohort of US firefighters showed a direct relationship between the number of hours spent fighting fires and lung cancer and leukemia mortality in firefighters. This link is a topic of continuing research in the medical community, as is cancer mortality in general among firefighters. Firefighters are exposed to a variety of carcinogens at fires, including both carcinogenic chemicals and radiation (alpha radiation, beta radiation, and gamma radiation). As with other emergency workers, firefighters may witness traumatic scenes during their careers. They are thus more vulnerable than most people to certain mental health issues such as post-traumatic stress disorder and suicidal thoughts and behaviors. Among women in the USA, the occupations with the highest suicide rates are police and firefighters, with a rate of 14.1 per 100 000, according to the National Center for Injury Prevention and Control, CDC. Chronic stress over time attributes to symptoms that affect first responders , such as anxiousness, irritability, nervousness, memory and concentration problems can occur overtime which can lead to anxiety and depression. Mental stress can have long lasting affects on the brain. A 2014 report from the National Fallen Firefighters Foundation found that a fire department is three times more likely to experience a suicide in a given year than a line-of-duty death. Mental stress of the job can lead to substance abuse and alcohol abuse as ways of coping with the stress. Another long-term risk factor from firefighting is exposure to high levels of sound, which can cause noise-induced hearing loss (NIHL) and tinnitus. NIHL affects sound frequencies between 3,000 and 6,000 Hertz first, then with more frequent exposure, will spread to more frequencies. Many consonants will be more difficult to hear or inaudible with NIHL because of the higher frequencies effected, which results in poorer communication. NIHL is caused by exposure to sound levels at or above 85dBA according to NIOSH and at or above 90dBA according to OSHA. dBA represents A-weighted decibels. dBA is used for measuring sound levels relating to occupational sound exposure since it attempts to mimic the sensitivity of the human ear to different frequencies of sound. OSHA uses a 5-dBA exchange rate, which means that for every 5dBA increase in sound from 90dBA, the acceptable exposure time before a risk of permanent hearing loss occurs decreases by half (starting with 8 hours acceptable exposure time at 90dBA). NIOSH uses a 3-dBA exchange rate starting at 8 hours acceptable exposure time at 85dBA. The time of exposure required to potentially cause damage depends on the level of sound exposed to. The most common causes of excessive sound exposure are sirens, transportation to and from fires, fire alarms, and work tools. Traveling in an emergency vehicle has shown to expose a person to between 103 and 114dBA of sound. According to OSHA, exposure at this level is acceptable for between 17 and 78 minutes and according to NIOSH is acceptable for between 35 seconds and 7.5 minutes  over a 24-hour day before permanent hearing loss can occur. This time period considers that no other high level sound exposure occurs in that 24-hour time frame. Sirens often output about 120 dBA, which according to OSHA, 7.5 minutes of exposure is needed and according to NIOSH, 9 seconds of exposure is needed in a 24-hour time period before permanent hearing loss can occur. In addition to high sound levels, another risk factor for hearing disorders is the co-exposure to chemicals that are ototoxic. The average day of work for a firefighter can often be under the sound exposure limit for both OSHA and NIOSH. While the average day of sound exposure as a firefighter is often under the limit, firefighters can be exposed to impulse noise, which has a very low acceptable time exposure before permanent hearing damage can occur due to the high intensity and short duration. There are also high rates of hearing loss, often NIHL, in firefighters, which increases with age and number of years working as a firefighter. Hearing loss prevention programs have been implemented in multiple stations and have shown to help lower the rate of firefighters with NIHL. Other attempts have been made to lower sound exposures for firefighters, such as enclosing the cabs of the firetrucks to lower the siren exposure while driving. NFPA (National Fire Protection Association) is responsible for occupational health programs and standards in firefighters which discusses what hearing sensitivity is required to work as a firefighter, but also enforces baseline (initial) and annual hearing tests (based on OSHA hearing maintenance regulations). While NIHL can be a risk that occurs from working as a firefighter, NIHL can also be a safety concern for communicating while doing the job as communicating with coworkers and victims is essential for safety. Hearing protection devices have been used by firefighters in the United States. Earmuffs are the most commonly used hearing protection device (HPD) as they are the most easy to put on correctly in a quick manner. Multiple fire departments have used HPDs that have communication devices built in, allowing firefighters to speak with each other at safe, but audible sound levels, while lowering the hazardous sound levels around them. The Paris Fire Brigade is a French Army unit which serves as the fire service for Paris and certain sites of national strategic importance. In Germany, even the smallest villages are required to have a volunteer fire department, called the "Freiwillige Feuerwehr", by law. Even the biggest German city, Berlin, with more than 3.6 million inhabitants, has volunteer firefighters in addition to a regular paid fire service. However, due to urbanization and a shrinking population, very small villages may be exempt from this requirement if the area can be covered by the fire department from a neighboring town. If this is not the case, a compulsory fire department is established by conscripting every able-bodied inhabitant between 18 and 63 years of age. A career fire service is mandatory for towns with more than 100,000 inhabitants. Consequently, only 103 German cities have a career fire service, called the "Berufsfeuerwehr", but in all of these cities a volunteer fire service exists too. In cities with a career fire service, volunteer fire brigades support the career fire service in the case of several emergencies at once, bigger fires, accidents and disasters. In a few of the bigger towns (usually more than 35,000 inhabitants) a large volunteer fire department could consist of a core of career firefighters supported by true volunteer firefighters. However, the official title of those departments is nevertheless "volunteer fire service". The structure in Austria is similar to Germany. There are just six career fire services in Vienna, Graz, Innsbruck, Klagenfurt, Salzburg and Linz. As of 2007, some 4,527 volunteer fire departments, the back-bone of the Austrian fire service, could rely on about 320,000 men and women voluntary firefighters as active members. Fire departments exist in even the smallest villages, where they contribute to community life, usually by organizing fairs and other fund-raising activities. In Venezuela, there are, beside the types mentioned above, university firefighters. They attend any emergency inside the campus and the zones around; however, their most important job is to develop new technologies in this area, thanks to the high level of education of its members: in the Simón Bolívar University Volunteer Fire Department, around 80% of its members have a university degree or are in the process of obtaining one. In Japan, fire services are organized on a city/town/village basis. There are 894 fire headquarters and 3,598 volunteer fire corps. These have a total of 155,000 active career firefighters and 21,000 vehicles with 4,800 fire houses; 920,000 volunteer firefighters share an additional 51,000 trucks. In Romania, the Romanian General Inspectorate for Emergency Situations is responsible for fire fighting and civil defense. In Singapore, the Singapore Civil Defence Force is responsible for fire fighting and emergency response. 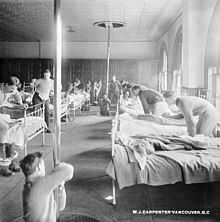 In addition to career firefighters, there are conscripted firefighters, generally young adults between the ages of 18-25, that join under the national service scheme (see Conscription in Singapore). In India municipalities are required by law to have a fire brigade and participate in a regional fire service. Each city has its own fire brigade. The main functions of firefighting services in India are provision of fire protection and of services during emergencies such as building collapses, drowning cases, gas leakage, oil spillage, road and rail accidents, bird and animal rescues, fallen trees, appropriate action during natural calamities, and so on. Industrial corporations also have their own firefighting service. Each airport and seaport has its own firefighting units. Chile is the only country in the world where all firefighters are volunteers. The Great Fire of Valparaíso in April 2014 stirred a debate on whether the system should be kept this way or whether paid firefighters should be introduced. The fire departments are part of the Junta Nacional de Bomberos (National Board of Firefighters), founded in 1970. This institution works with all the companies in the country, coordinating, guiding and serving as a link between the government and the Corps. The training in Denmark is at their local firestation. You start on a standard training where you are learning to cut open cars and other vehicles together with a special first aid course. This takes around a year to complete, and when you have that "degree" it is posible to be educated even further. The focus is now "how to put out fires", here you undergo training with fire and specialized drills to improve the skills of the firefighters. This education takes around a year aswell. After this you are a fully educated firefighter and can now move into buildings on fire. You can be educated furthermore, when you have experience. After 5 years of expirence you can take "holdleder" which is an teamleader on the scene of the fire, here you are in charge of a team with four to five members. when you have 5 years of expirence with teamleader, you can be "indsatsleder" whom job is to help the teamleader in the logistics and is the leader of the scene and has the most vital job. The expedient and accurate handling of fire alarms or calls are significant factors in the successful outcome of any incident. Fire department communications play a critical role in that successful outcome. Fire department communications include the methods by which the public can notify the communications center of an emergency, the methods by which the center can notify the proper fire fighting forces, and the methods by which information is exchanged at the scene. One method is to use a megaphone to communicate. A telecommunicator (often referred to as a 000 Operator) has a role different from but just as important as other emergency personnel. The telecommunicator must process calls from unknown and unseen individuals, usually calling under stressful conditions. He/she must be able to obtain complete, reliable information from the caller and prioritize requests for assistance. It is the dispatcher's responsibility to bring order to chaos. While some fire departments are large enough to utilize their own telecommunication dispatcher, most rural and small areas rely on a central dispatcher to provide handling of fire, rescue, and police services. Firefighters are trained to use communications equipment to receive alarms, give and receive commands, request assistance, and report on conditions. Since firefighters from different agencies routinely provide mutual aid to each other, and routinely operate at incidents where other emergency services are present, it is essential to have structures in place to establish a unified chain of command, and share information between agencies. The U.S. Federal Emergency Management Agency (FEMA) has established a National Incident Management System. One component of this system is the Incident Command System. All radio communication in the United States is under authorization from the Federal Communications Commission (FCC); as such, fire departments that operate radio equipment must have radio licenses from the FCC. Ten codes were popular in the early days of radio equipment because of poor transmission and reception. Advances in modern radio technology have reduced the need for ten-codes and many departments have converted to simple English (clear text). Many firefighters are sworn officers with command structures similar to the military and police. They do not have general police powers (some firefighters in the United States have limited police powers, like fire police departments, while certain fire marshals have full police powers, i.e. the ability to make warantless arrests, and authority to carry a firearm on and off-duty), but have specific powers of enforcement and control in fire and emergency situations. The basic American fire department unit is a small unit called a "company", a group of firefighters who typically work on the same engine. Commonwealth fire services are more likely to be organized around a "watch", who work the same shift on multiple engines. Ranks are divided between Company Officers and Fire Department Officers, which can be subdivided between Active Officers (Field Officers) and Administrative Officers each. The active officers are the captain, and two or three lieutenants, these three active officers are distinguished by their red helmets. French civilian fire services, which historically are derived from French army sapper units, use French Army ranks. The highest rank in many departments is full colonel. Only the NCO rank of major is used in both the Paris Fire Brigade and the Marseille Naval Fire Battalion; since 2013 it has been abolished in the other fire departments. In Germany every federal state has its own civil protection laws thus they have different rank systems. Additionally, in the volunteer fire departments, there is a difference between a rank and an official position. This is founded on the military traditions of the fire departments. Every firefighter can hold a high rank without having an official position. A firefighter can be promoted by years of service, training skills and qualifications. Official positions are partly elected or given by capabilities. These conditions allow that older ordinary firefighters have higher ranks than their leaders. But through this ranks are no authorities given (Brevet). Bachelor of Engineering and two years departmental training. Master of Engineering and two years of departmental training. Firefighters in Indonesia form part of the civil service of local governments and wear variant forms of uniforms worn by civil servants and employees. The Vigili del Fuoco, (literally the word "Vigili" comes from the latin word "Vigiles", which means "who is part of certain guards") have the official name of Corpo nazionale dei vigili del fuoco (CNVVF, National Firefighters Corps). The CNVVF is the Italian institutional agency for fire and rescue service. It is part of the Ministry of Interior's Department of Firefighters, Public Rescue and Public Protection. The CNVVF task is to provide safety for people, animals and property, and control the compliance of buildings and industries to fire safety rules. The Ministry of the Interior, through the CNVVF, adopts fire safety rules with ministerial decrees or other lower rank documents. The CNVVF also ensures public rescue in emergencies that involves the use of chemical weapons, bacteriological, radiological and materials. Since 2012 the Corps uses its own rank titles (dating from 2007) with matching military styled insignia in honor of its origins. In 2016 the CNVVF has been committed in forest firefighting activities together with the regional forest agencies, following the suppression of the National Forest Guards, which were merged into the Carabinieri (firefighters were integrated into the CNVVF). .
Italian HAZMAT unit parading in Rome. Assistant Chief Fire Officer ? Japanese Fire Department's rank insignias are place on a small badge and pinned above the right pocket. Rank is told by stripes and Hexagram stars. The design of the insignias came from older Japanese style military insignias. Officers and Team Leaders could wear an arm band on the arm of fire jacket to show status as command leader. Sometimes rank can be shown as different color fire jacket for command staff. The color whites and gray are reserved for EMS. Orange is reserved for rescuer. In New Zealand, rank is shown on epaulettes on firefighters' station uniform, and through colors and stripes on firefighter helmets. As the nation only has a single fire department, the New Zealand Fire Service, ranks are consistent through the country. A Russian firefighter with a head of duty shift fire station helmet. In the Russian Federation, the decals are applied symmetrically on both sides of the helmet (front and rear). The location of the decals on the special clothing and SCBA is established for each fire department of the same type within the territorial entity. The following ranks are used by State Fire Service civilian personnel, while military personnel use ranks similar to those of the Police of Russia, due to their pre-2001 history as the fire service of the Ministry of Internal Affairs of the Russian Federation before all firefighting services were transferred to the Ministry of Emergency Situations. Tunisian firefighter's ranks are actually the same as the army, police and national garde. An American firefighter with a lieutenant's helmet. Typical rank insignia for an American fire department. Division Chief or Assistant /Deputy Asst. In many fire departments in the U.S., the captain is commonly the commander of a company and a lieutenant is the supervisor of the company's firefighters on shift. There is no state or federal rank structure for firefighters and each municipality or volunteer fire department creates and uses their own unique structure. Still, some other American fire departments such the FDNY use military rank insignia in addition or instead of the traditional bugles. Additionally, officers on truck companies have been known to use rank insignias shaped like axes for Lieutenants (1) and Captains (2). Vancouver firemen responding to a fire alarm, Vancouver, British Columbia. Photograph taken by W.J. Carpenter in 1910. Although people have fought fires since there have been valuable things to burn, the first instance of organized professionals combating structural fires occurred in Ancient Egypt. 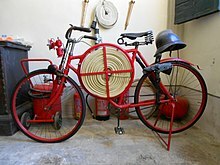 Likewise, fire fighters of the Roman Republic existed solely as privately organized and funded groups that operated more similarly to a business than a public service; however, during the Principate period Augustus revolutionized firefighting by calling for the creation of a fire guard that was trained, paid, and equipped by the state- the first truly public and professional firefighting service. Known as the Vigiles, they were organised into cohorts and also served as a night watch and city police force. The earliest American fire departments were volunteers, including the volunteer fire company in New Amsterdam, now known as New York. Fire companies were composed of citizens who volunteered their time to help protect the community. As time progressed and new towns popped up throughout the region there was a sharp increase in the number of volunteer departments. The first career fire department was not established in the United States until 1853 in Cincinnati, Ohio (Cincinnati Fire & EMS Department). Many large cities began establishing paid, full-time, staff in order to try facilitate greater fire-related call volume. St. Louis Fire Department followed Cincinnati four years later and became the second established career fire department in the country followed by other large cities like New York (FDNY). City fire departments draw their funding directly from city taxes and share the same budget as other public works like the police department and trash services. Aside from big city fire departments, many populated suburbs and towns have career fire departments. The primary difference between a municipality department and a City department is the funding. Municipal fire departments do not share their budget with any other service and are considered to be private entities within a jurisdiction. This means that they have their own taxes that feed into their budgeting needs. Another main difference is the structure of the department. City fire departments have the mayor at the top of the chain whereas municipal departments have elected board officials who help maintain and run the department along with the chief officer staff. In a country with a comprehensive fire service, fire departments must be able to send firefighters to emergencies at any hour of day or night, to arrive on the scene within minutes. In urban areas, this means that full-time paid firefighters usually have shift work, with some providing cover each night. On the other hand, it may not be practical to employ full-time firefighters in villages and isolated small towns, where their services may not be required for days at a time. For this reason, many fire departments have firefighters who spend long periods on call to respond to infrequent emergencies; they may have regular jobs outside of firefighting. Whether they are paid or not varies by country. In the United States and Germany, volunteer fire departments provide most of the cover in rural areas. In the United Kingdom and Ireland, by contrast, actual volunteers are rare. Instead, "retained firefighters" are paid for responding to incidents, along with a small salary for spending long periods of time on call. In popular literature firefighters are sometimes depicted with Dalmatian dogs. This breed originated in southern Europe and was primarily responsible for herding livestock and running alongside carriages drawn by horses. In the days of horse-drawn fire vehicles, the horses were usually released on arrival at the fire and the Dalmatians would lead the horses through traffic and to a safe place to wait until the fire was out. Dalmatians also filled the role of protecting the horses' feet from other dogs as equipment was being transported to the fire scene. In reality, most fire dogs were mutts pulled from the street (and thus cheaper to acquire). In addition, Dalmatians have a reputation for skittishness and congenital defects, such as deafness and more violent tendencies due to inbreeding. Funds for fire-fighting equipment may be raised by the firefighters themselves, especially in the case of volunteer organizations. Events such as pancake breakfasts and chili feeds are common in the US. Social events are also used to raise money, including dances, community fairs and car washes. ^ "Firefighter job profile". Prospects.ac.uk. ^ "Plenty of firefighters, but where are the fires?". The Boston Globe. 2013-09-07. Retrieved 2017-09-22. ^ "What Is Sudden Cardiac Arrest?". NHLBI. June 22, 2016. Archived from the original on 28 July 2016. Retrieved 16 August 2016. ^ "News". www.london-fire.gov.uk. Archived from the original on 13 August 2017. Retrieved 5 May 2018. ^ "Surrey firefighters called to almost 300 medical emergencies during co-responding trial". Surrey Advertiser. 9 May 2016. Retrieved 3 September 2018. ^ "NFPA 5000 Building Construction and Safety Code". National Fire Protection Association (NFPA). Retrieved 8 July 2018. ^ "Overview of the International Fire Code". International Code Council (ICC). 2015-03-20. Retrieved 8 July 2018. ^ "NFPA Fire Sprinkler Initiative". National Fire Protection Association (NFPA). Retrieved 8 July 2018. ^ Pollack, Keshia; Frattaroli, Shannon; Somers, Scott (August 24, 2015). "Research Shows Residential Sprinklers Save Lives" (Fire and Worker Health and Safety). SAGE Journal. Retrieved 8 July 2018. ^ Faturechi, Robert (June 22, 2016). "The Fire Sprinkler War, State by State". Propublica. Retrieved 8 July 2018. ^ "Anti-sprinkler legislation". National Fire Protection Association (NFPA). Retrieved 8 July 2018. ^ James Barron (January 24, 2005). "3 Firefighters Die in Blazes in Brooklyn and Bronx". The New York Times. ^ "OSHA Technical Manual (OTM) - Section III: Chapter IV: Heat Stress". Osha.gov. Retrieved 2012-12-10. ^ National Institute for Occupational Safety and Health Alert: Preventing Injuries and Deaths of Fire Fighters due to Structural Collapse. August 1999. ^ National Institute for Occupational Safety and Health Alert: Preventing Injuries and Deaths of Fire Fighters Due to Truss System Failures. May 2005. ^ Kales, Stefanos N.; Soteriades, Elpidoforos S.; Christophi, Costas A.; Christiani, David C. (2007). "The New England Journal of Medicine", March 22, 2007, Accessed:July 17, 2011". New England Journal of Medicine. 356 (12): 1207–1215. CiteSeerX 10.1.1.495.4530. doi:10.1056/NEJMoa060357. PMID 17377158. ^ National Institute for Occupational Safety and Health Alert: Preventing Fire Fighter Fatalities Due to Heart Attacks and Other Sudden Cardiovascular Events. July 2007. ^ Daniels, Robert D. (17 December 2014). "Is There a Link Between Firefighting and Cancer? – Epidemiology in Action". National Institute for Occupational Safety and Health. Retrieved 6 January 2015. ^ "Study of Cancer among U.S. Fire Fighters". National Institute for Occupational Safety and Health. 25 July 2014. Retrieved 6 January 2015. ^ Daniels RD, Bertke S, Dahm MM, Yiin JH, Kubale TL, Hales TR, Baris D, Zahm SH, Beaumont JJ, Waters KM, Pinkerton LE (2015). "Exposure-response relationships for select cancer and non-cancer health outcomes in a cohort of US firefighters from San Francisco, Chicago and Philadelphia (1950-2009)". Occupational and Environmental Medicine. 72 (10): 699–706. doi:10.1136/oemed-2014-102671. PMC 4558385. PMID 25673342. ^ a b IARC Working Group on the Evaluation of Carcinogenic Risks to Humans (2010). "Painting, firefighting, and shiftwork". IARC Monographs on the Evaluation of Carcinogenic Risks to Humans / World Health Organization, International Agency for Research on Cancer. 98: 9–764. PMC 4781497. PMID 21381544. ^ "Fire fighters' battle with PTSD: "Every day is an anxious day"". The Guardian. 23 August 2017. Retrieved 22 September 2017. ^ Berger, William; Coutinho, Evandro Silva Freire; Figueira, Ivan; Marques-Portella, Carla; Luz, Mariana Pires; Neylan, Thomas C.; Marmar, Charles R.; Mendlowicz, Mauro Vitor (2012-06-01). "Rescuers at risk: a systematic review and meta-regression analysis of the worldwide current prevalence and correlates of PTSD in rescue workers". Social Psychiatry and Psychiatric Epidemiology. 47 (6): 1001–1011. doi:10.1007/s00127-011-0408-2. ISSN 0933-7954. PMC 3974968. PMID 21681455. ^ Stanley, Ian H.; Hom, Melanie A.; Joiner, Thomas E. (2016). "A systematic review of suicidal thoughts and behaviors among police officers, firefighters, EMTs, and paramedics". Clinical Psychology Review. 44: 25–44. doi:10.1016/j.cpr.2015.12.002. PMID 26719976. ^ Stanley, Ian H.; Hom, Melanie A.; Hagan, Christopher R.; Joiner, Thomas E. (2015). "Career prevalence and correlates of suicidal thoughts and behaviors among firefighters". Journal of Affective Disorders. 187: 163–171. doi:10.1016/j.jad.2015.08.007. PMID 26339926. ^ Lindahl, Björn. "Why are suicide rates higher for farmers and firefighters than for librarians?". Nordic Labour Journal. ^ "Health & Wellness: How Firefighters Can Manage Stress". Firehouse. Retrieved 2018-09-11. ^ "Stress takes heavy toll on firefighters, experts say". USA TODAY. Retrieved 2018-09-11. ^ "Special report: Firefighter behavioral health - NFPA Journal". www.nfpa.org. Retrieved 2018-09-11. ^ a b c d e f Hong, O.; Samo, D.G. (1 August 2007). "Hazardous Decibels: Hearing Health of Firefighters". Workplace Health & Safety. 55 (8): 313–319. doi:10.1177/216507990705500803. ^ a b c d e f g h i j k l m Tubbs, R.L. (1995). "Noise and Hearing Loss in Firefighting". Occupational Medicine. 10 (4): 843–885. ^ a b c "Noise exposure computation - 1910.95 App A | Occupational Safety and Health Administration". www.osha.gov. ^ a b c d e "NIOSH/Criteria for a Recommended Standard--Occupational Noise Exposure, 1998". www.nonoise.org. ^ Johnson, Ann-Christin and Morata, Thais (2010). "Occupational exposure to chemicals and hearing impairment. The Nordic Expert Group for Criteria Documentation of Health Risks from Chemicals. 44 (4): 177" (PDF). Arbete och Hälsa. 44: 177. ^ Taxini, Carla; Guida, Heraldo (6 January 2014). "Firefighters' noise exposure: A literature review". International Archives of Otorhinolaryngology. 17 (1): 080–084. doi:10.7162/S1809-97772013000100014. PMID 25991998. ^ a b "Uniform rank markings". New Zealand Fire Service. Archived from the original on 23 February 2014. Retrieved 10 January 2015. Look up firefighter in Wiktionary, the free dictionary.